Now is the time to get something special done for the Dad, Papa, Daddy, Father in your life! I wanted the family to have matching t-shirts. This isn’t something we usually do and I have been envious of some pictures and so, I figured I would try it. (Not so crafty, here and here are some pre-made versions on Etsy) This is a no-sew, easy, inexpensive version. 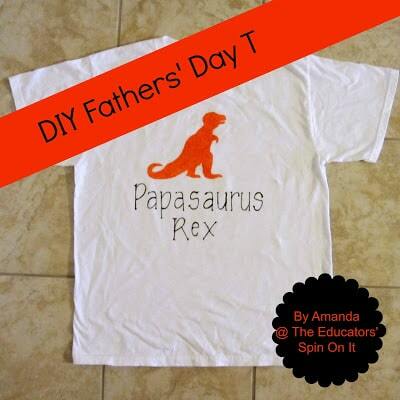 We are planning to wear them on Fathers Day and have a ROARING good time! This post contains affiliate links to Amazon.com, we’ve done the shopping for you with the products we used to make your project go smoothly. « Top 10 Ways to Cook with Books with your Kids this Summer! So cute! We just did something similar for my Dino obsessed son. But the Papasauraus letting is just swell 🙂 I LOVE it. I hope I can make another one… now I hope to find someone who can write it for me lol! 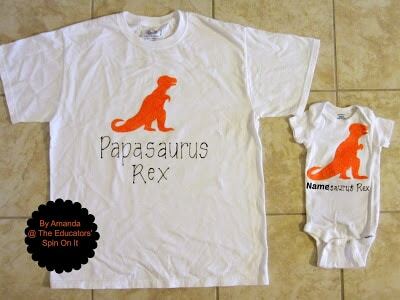 I love this idea, I just can't find as cute of a t rex as you have. Where did you find it? Hi, I love this!! 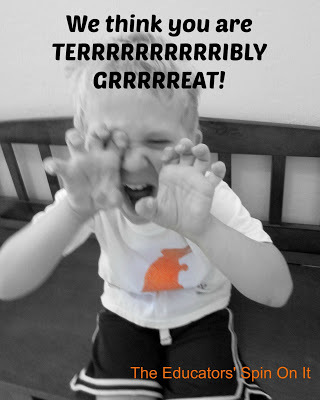 I just can't find a T rex like your! Its so cute, not mean. Where did you find it?